Spacious, Comfortable and Convenient, this vacation rental property has it all. Four bedrooms that sleep 8 comfortably and three and half bathrooms are spread out amongst two floors and 3200 square feet of living space. The main level has an open concept living room and kitchen area; complete with a 55" Flat Screen TV. The formal dining room is large and provides direct access to the side porch with a separate outdoor dining area, providing you with unparalleled views of the mountains. The main level features the master suite with an attached bathroom and garden tub, plus two guest bedrooms; one with a queen bed and the other with two twin beds. The lower level/basement features one additional guest bedroom with a queen bed and one full bathroom. The lower level also includes an awesome bonus room/rec area featuring a shuffleboard table, pool table, "Pop A Shot" basketball and a second TV with DVD player. Located in Sypes Canyon, this property is in the middle of it all with easy access to a number of outdoor attractions and activities including the M hiking trail, the Gallatin River and Bridger Bowl. 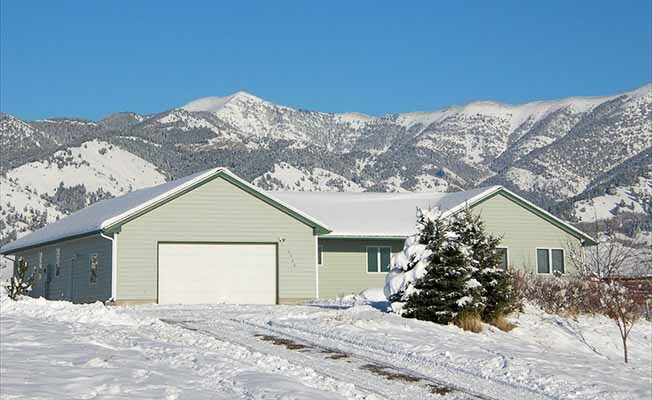 Located minutes from Downtown Bozeman. All utilities, lawn care and snow removal, plus Internet and Satellite TV provided.